Here’s what I’ve learned. People will be people, you can trust no one. It’s not a bad thing/cynical. I trust people to be people, to act in their own self-interests. If you understand that, you can use that! People will be disloyal, I’ve heard there are wives that sleep around, etc. We are disloyal, but loving, kind, gracious. We are a contradiction, the negatives are not bad if you see them for what they are. You cannot trust people, big deal, you CAN trust them to be self-interested, and I use that all the f-cking time. The most beautiful in the world. It has a barrier reef, 2nd in the world. I had 5 boats on the beach on the ocean, you try that anywhere else. It has jungles and ruins that haven’t even been explored. The problem is that it has people there, people descended from pirates. There is nothing illegal that the government there is not into. The government is smart if you just go there as an American you will not be bothered. I lived in the jungles where I was the only white person, and they were on to me. They asked me for $2M, weeks later 40+ armed men stormed my house, shot my favorite dog, and held me in the sun with my hands tied. The next day the congressman came and apologized asked for the $2M again. I should have done that rather than tell him to get the f-ck off my property. Money corrupts. Once you have enough money, you have no friends, none, even the most dedicated friend you had cannot stop thinking about his mortgage, or new car, or new wife, and friendship ends. Second, your life becomes a nightmare. I was getting 1000/day asking for help, or asking for me to invest (the best was rocket-power roller skates, I almost invested). Money now has become information, how does Google live? They gather information on smartphones and their services. This is far worse than paper. Paper doesn’t try to get into your head, to find out who you’re f-cking, etc. We are all jealous, hopeful and ambitious, and as long as that exists we’ll all have chaos. Unlikely. Creating a clear content policy is another of my immediate priorities. We will make it very clear what is and is not acceptable behavior on reddit. This is still a work in progress, but our thinking is along these lines: Nothing illegal. Nothing that undermines the integrity of reddit. Nothing that causes other individuals harm or to fear for their well-being. Banning content will be a last resort…I don’t want to ever ban content. Sometimes, however, I feel we have no choice because we want to protect reddit itself. Of course the board wants to see growth. I want to see growth, too. We’re not going to see much growth without serious product efforts, and we’re not going to get serious product efforts without more resources. Fortunately, I have the ability to get those resources, so that’s what I’ll do. I’ve had some time to think about how to respond to the extraordinary kindness and support you’ve shown me. And here it is: I’ll never forget my time at reddit. You allowed me to be a part of some of the greatest conversations of our time, and it was an honor to be your ambassador. I just want to take a moment to say thank you to all of you who have reached out. Thank you for everything you’ve given me. From your messages to your artwork, I am deeply moved and grateful beyond words, and your encouragement has meant more than you’ll ever know. I’ve been incredibly humbled and honored to serve this community, and I truly believe all voices matter. Your voices matter. You proved that this weekend. And really, this weekend wasn’t about me. It was about you. And if I know one thing about this community, it’s that you’ll continue making your voices heard. And that’s an inspiration. Most people are saying that Victoria leaving was the straw that broke the camel’s back. Reddit’s failing at communication with moderators (and users) goes so far back, even to when I wasn’t on this site. Pao apologizes to the Reddit community for how the company handled Taylor’s firing. I’m sorry we let our community down yesterday. We should have informed our community moderators about the transition and worked through it with them…Most of the community is made up of thoughtful people, and they can appreciate what we all do, even if we don’t always agree. Pao also say the tens of thousands of calls from irate users for her to resign do not faze her. It’s an exciting job. We’re doing a lot behind the scenes that people have not seen yet. Today, we learned that Victoria was unexpectedly let go from her position with Reddt. We all had the rug ripped out from under us and feel betrayed. Ohanian makes an announcement in regards to Taylor’s removal. We get that losing Victoria has a significant impact on the way you manage your community. I’d really like to understand how we can help solve these problems, because I know r/IAMA thrived before her and will thrive after…We’re prepared to help coordinate and schedule AMAs. I’ve got the inbound coming through my inbox right now and many of the people who come on to do AMAs are excited to do them without assistance (most recently, the noteworthy Channing Tatum AMA). This is met with harsh criticism and has a total comment score of under -2500. Sanders answers questions on Reddit. My first effort would be to rally the American people to demand that Congress pass a progressive agenda which reverses the decline of our middle class. We have got to create millions of decent-paying jobs rebuilding our infrastructure, we’ve got to raise the minimum wage to a living wage, we’ve got to overturn this disastrous Citizens United Supreme Court decision and we have to transform our energy system in order to protect us from climate change. If the American people are politically active and demand that Congress act on their behalf, we can accomplish those goals and much more. We’re working on a way to give 10% of our shares from this round to the reddit community. I hope we can increase community ownership over time–I’ve always thought communities like reddit should mostly own themselves, and that it’s time for some innovation around corporate structure here. I’m giving the company a voting proxy on my shares. Founders should never expect employees to work as hard and care as much as they do, but still, if you join an early-stage startup, expect to work very hard. Most people at Facebook still seem to work very hard. Generally, I think companies should hold off the transition to feeling ‘corporate’ as long as possible, but transition to something with better work-life balance after a few years–no one can work around the clock forever. All of that said, I do think most startups need to get some basic HR in place sooner than they usually do. Focus on getting a small number of super-engaged users that love you, and them spread the community. If you’re building it for an exit, you will probably be disappointed. That’s not a specific statement about a community site but a general comment about startups. Hoover answers questions on the logo, joining Y Combinator, and how it selects products. We encourage people to share their product on PH as this sparks discussion and frankly drives more traffic to the site; however, the quality of products (which I know, is subjective) is incredibly important. If people are disinterested in the products featured on PH, nothing else matters. It’s been suggested internally; I remember a particularly long email thread where numerous people were passionately debating it. Plenty of ideas get kicked around about how we can separate ourselves from negative perceptions that no longer reflect our product today. Jericho hosts an “Ask Me Anything” chat on Reddit. Jericho discusses wrestling, Fozzy and his current status with WWE. I can’t balance both. Which [is] why I only come back to the WWE when Fozzy is taking a break. My WWE stints will be more like tours now. And this tour ends September in Nashville. In my opinion ISIS has done nothing good, except we aren’t being shelled anymore, so that’s the bright side. They aren’t really trying to win the hearts and minds here. They run the “Da’wah” tents for children, but those are dangerous. They’ve convinced many kids to join ISIS, without their parent’s knowledge. It’s brainwashing. There’s always a “barrier”between ISIS members and civilians. Today an ISIS guy dressed in civilian clothing went into a store and said “could I buy some cigarettes, but I don’t want the ISIS guys to know”. The shop owner closes shop, and hands him a pack. The guy then leaves and calls up an ISIS truck, and they search his shop and burn the cigarettes. Cornette hosts Reddit Ask Me Anything segment. He discusses WWE booking, Kevin Steen and Colt Cabana. Colt is a fine mid-card wrestler, an average look and an oK at best promo, he was perfect for WWE. 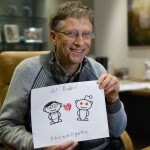 Bill Gates does an AMA on Reddit, where he discusses vaccines, climate change, And Steve Jobs. Original thread here. A summary of Gates’ answers can be found here. 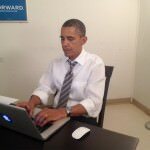 President Obama participates in a surprise open question-and-answer session on the Web community Reddit, as the subject of one of the site’s regular “Ask Me Anything” threads. Reddit’s site experienced some outages immediately following the announcement, due to increased traffic.